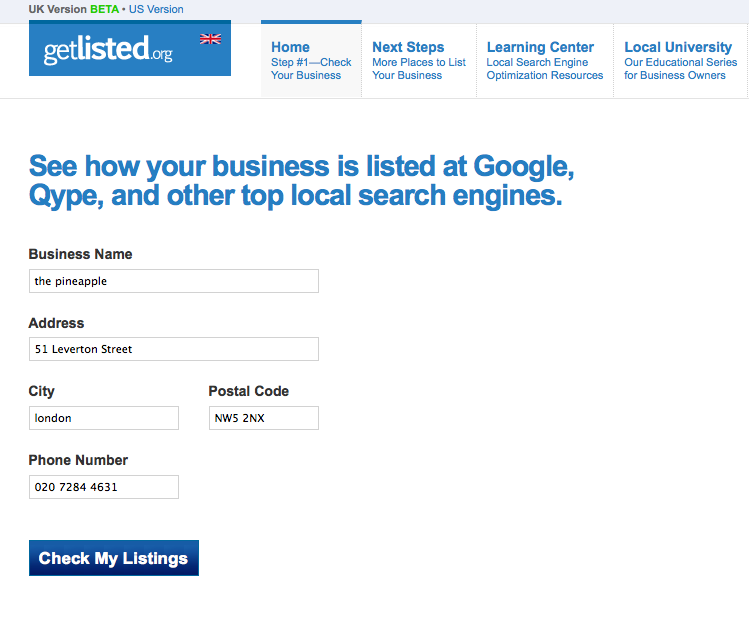 GetListed and Palore’s AmIVisible were among the earliest of these “presence management” tools. Marchex was the first to offer combined presence and reputation management. Now most of the reputation management tools and platforms include similar functionality to varying degrees. — Exercise broad control over your profile’s content so you can easily display your business information and fresh content about your latest offers and events. If a customer posts an inappropriate comment, you may remove it from the public eye and address it in private — just like you would in person. — Engage with your customers when they are in the right frame of mind, ready to see what you have to offer, away from the noise of other messages. — Create the one customer list you will ever need by importing your existing customer database into Bizzy with a simple one-step upload tool, or by adding a customer on the fly by simply entering their email address. — Create marketing messages in a snap. Great concept, though not unique (think: “fan,” “follow”). It’s also a direction that many tools and companies are moving (see “reputation management” generally and also Perry Evans’ Closely). Now we come to the familiar “poulet et œufs” problem — usage/adoption. AT&T is struggling with Buzz.com, which is intended to be an alternative consumer tool and distribution platform for its content and advertisers. Facebook and Twitter are both “critical mass” sites where SMBs can do some of what Bizzy offers — although there’s more structure and guidance at Bizzy. 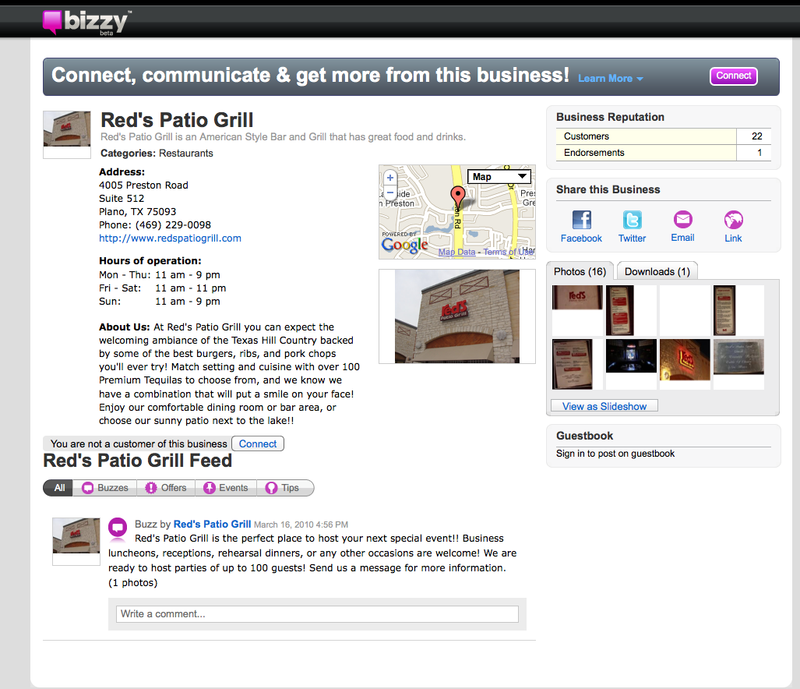 Bizzy appears to use Facebook and Twitter to distribute its messages and offers as well. As you can see in the above profile and press release bullets there are reputation management and SEO angles here. 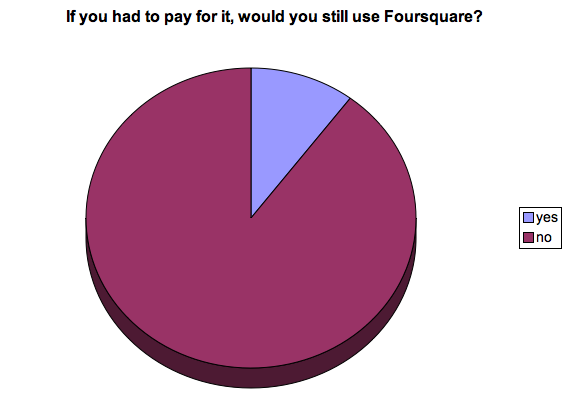 And perhaps SEO is the front door and primary user acquisition strategy for Reach. I’ll be going through this later today with them to gain more insight into the strategy and answers to some of these questions (as well as my personal existential questions). Groupon, Sure. But Is It Sustainable? The rapid rise of the “social commerce,” “group buying” or “social couponing” (whatever you want to call it) is sort of amazing to me. One interesting question that comes up in my mind is: Will the model that these sites offer start to “bleed” into other areas of local? Perhaps a better way to frame it is the following: will these types of sites put pressure on more traditional ad models being sold and promoted by other local sales channels, including TV, radio, print — even other online? They’re not selling leads or clicks or even calls; they’re selling customers (albeit at a massive discount so margins disappear for the SMB in some cases). There are also others in the market like RedBeacon and HelpHive, among a few others, that are taking a commission on work actually performed. These sorts of models make “advertiser” acquisition much easier: “customers not clicks.” How widespread might this become? That’s a question I’m mulling over. When Philz Coffee Inc. offered half-price $20 gift cards to users of the Groupon.com coupon site, the San Francisco chain of coffee shops figured it would get a few hundred takers. It got more than 2,000. Philz Coffee’s Jaber decided his company is established enough to rely on word-of-mouth marketing. Most of Groupon users that pounced on the gift-card offer were already Philz customers, so it didn’t provide too much benefit, he said . . .
Too much demand and many buyers were already customers . . .
There’s little SMB education or “best practices” right now on how/when to use these sites and how to “acquire” new customers who take advantage of these offers. Over time I would also imagine there will also be mechanisms for managing offers to existing customers or weeding them out entirely. Yesterday I asked LivingSocial CEO and Co-founder Tim O’Shaughnessy to pick some winners in the segment (beyond LivingSocial). He said that Groupon would clearly be one because of its scale and momentum. Then he saw Gilt Groupe as another very interesting player. He also said he thought one of the larger European companies would move into the US and become successful. I’ve had the debate recently with several people about whether the group buying model is sustainable. Right now these sites offer new business but I’m sure they’ll expand into CRM or loyalty programs over time as well. I suspect the model is sustainable although it will need to evolve somewhat over time — and some of the flaws identified above will need to be addressed. I would also assume that Groupon is on a course to go public. But there are plenty of smaller companies that cannot and so there will be consolidation and/or M&A opportunities for traditional publishers (YP, newspapers) and others (e.g., IAC) that want to get into the game. Facebook is also lurking here as a potentially major player. Right now Facebook really doesn’t have a product to sell to SMBs (notwithstanding Facebook Ads). This would be one that would also be extremely appealing to consumers; it’s a natural in a way. (2) Marchex will continue to receive unique content and information from Dow Jones Local Media Group as well as from other new content partners, including CitySquares, Joy of Spa and Measured Up, for inclusion in Marchex Reputation Management, which will benefit users by broadening the local business listing meta-data footprint of the product to nearly half-a-billion items (e.g., user reviews, listings, mentions on blogs and social media). Reputation management is becoming an essential layer of the local business product suite. Marchex was the first fully realized product in this segment for SMBs; however other companies have more recently developed competing products. I got a quick demo of the updated Marchex product this morning and found the it had been improved and upgraded further since I last saw it. 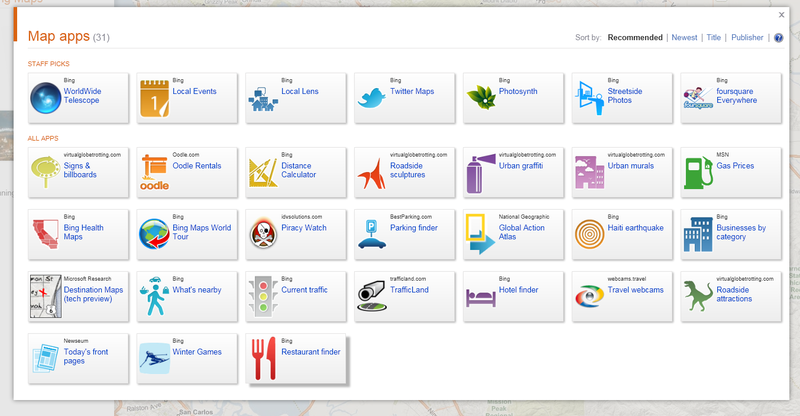 There are also a number of very interesting roadmap ideas. In its first foray into providing local editorial and advertising, Sugar Inc. (SugarInc.com) today announced it has signed a definitive agreement to acquire FreshGuide Inc., which operates FreshGuide.com and BookFresh (BookFresh.com). FreshGuide.com is an online women-focused city guide that provides access to exclusive daily offers from a well-edited selection of local businesses in beauty, health and fitness, dining, travel getaways and other relevant categories. BookFresh provides an online booking service for local businesses, such as spas and salons. [I will be] GM of FreshGuide and run Sugar’s local business. I am excited to create a female-focused local advertising platform that will leverage the offers capabilities of freshguide and the online bookings capabilities of BookFresh. I think local advertisers with an interest in wooing women, will find that we offer a compelling combination of merchant tools and a hyper-targeted female audience. David Mihm has published results of the third “Local Search Ranking Factors” survey in which he and other professional SEOs discuss the variables that affect local listing rankings, chiefly on Google. It represents a kind of consensus of highly informed (and practiced) professional opinion about local SEO. Mihm provides a summary overview of the results on his blog. For those professionally engaged in SEO it’s invaluable. And for those even casually interested it’s worth exploring. However there is an enormous amount of detail there: more than 70 “factors” discussed at length. The company has integrated call tracking from several providers into its automated paid search platform. Call Conversion Optimization, according to Kenshoo, automatically adjusts bidding in response to ads that are driving calls rather than resulting in mere clicks. (This theoretically could capture ads that contain phone numbers and deliver a call without generating a click.) The system thus learns to optimize bidding for those ads and keywords that are generating the phone calls. Designed specifically for organizations managing high volumes of SMB, regional, store or dealer campaigns, KENSHOO Local simplifies and automates client on-boarding and ongoing campaign management. Focusing on SMBs, who typically measure ROI from paid search campaigns by actual phone calls received, Kenshoo now empowers agencies to maximize return on the spend of their SMB clients. Filling the gap between online optimization and offline conversions, KENSHOO CCO allows IYPs, CMRs, agencies and retailers to apply search marketing to the real world interactions of selling their products and services. 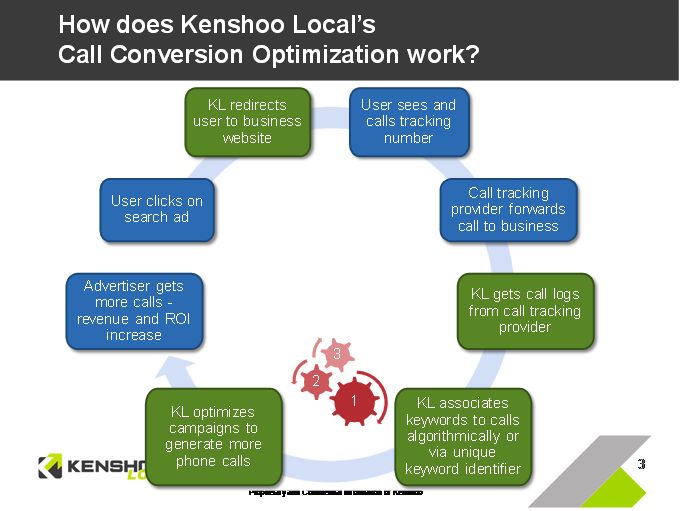 By integrating with industry-leading call tracking providers, KENSHOO CCO creates a unique closed-loop feedback mechanism between the online PPC campaigns and the phone calls they generate, continuously optimizing keyword bids to maximize the number and effectiveness of phone call conversions . . .
Todd Herrold, director, product management for Kenshoo Local told me that call tracking can be integrated at “any level,” from ad creative to individual keywords. I pressed him for specifics and metrics, but he said the company wasn’t quite ready to release that type of information about its clients or the product. However he did describe some pretty interesting work the company is doing with at least one of its clients to integrate with the latter’s CRM system and factor information gleaned by live agents into the process — so moving beyond the call into a subsequent interaction with a sales or customer service rep.
Today we’re excited to announce that Yelp advertisers now have the option to add video to their business profile page. I’ve personally viewed hundreds of these videos and I have to say that they can really help yelpers get a sense of a business’s ambiance, personality and specialties in a very short amount of time. Premium Video: Advertisers receive a 30-60 second custom video shot at their place of business by a professional filmmaker from the TurnHere network. Standard Video: Advertisers receive a 30 second video slideshow made from a series of photos provided by the business with music and custom voiceover narration. Long time in coming. 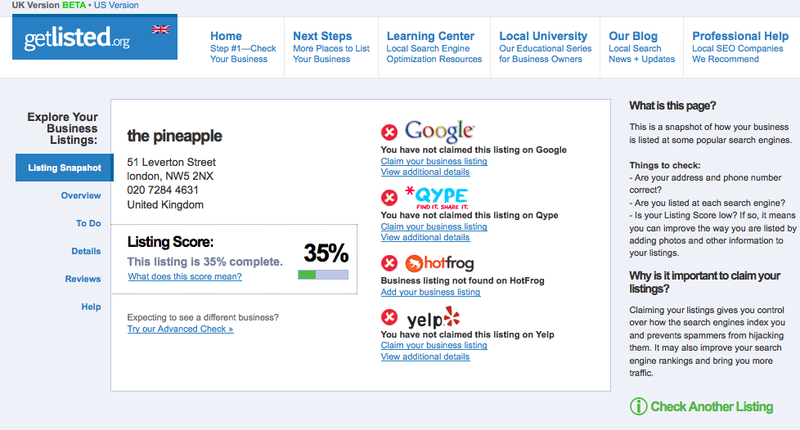 Seems like there’s lots of movement coming out of Yelp right now. Google has embarked on an initiative to photograph local business interiors for free. EveryScape charges money for the imagery. However EveryScape has been doing this for several years and has a big head start. The company is also going to announce a range of other local partners in the coming weeks and months. 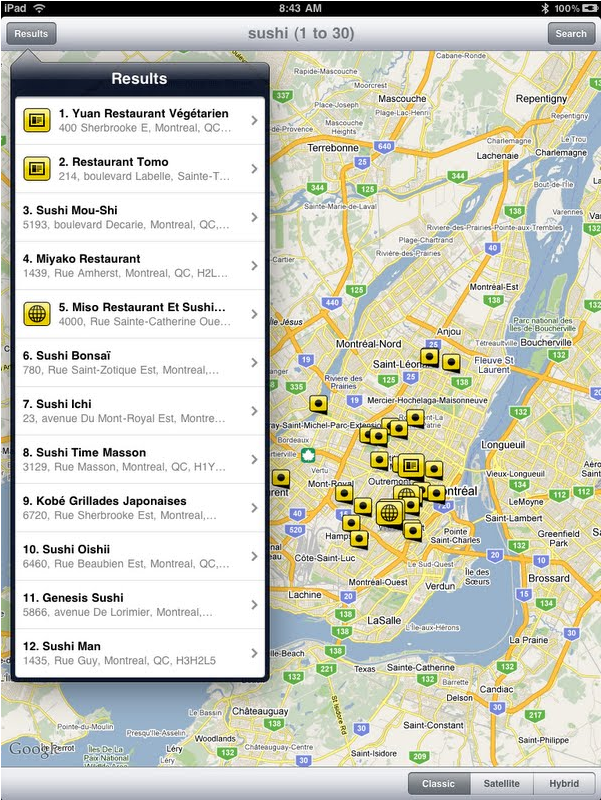 Here’s the Bing Maps blog post announcing “EveryScape Eats” and other Map apps as well. 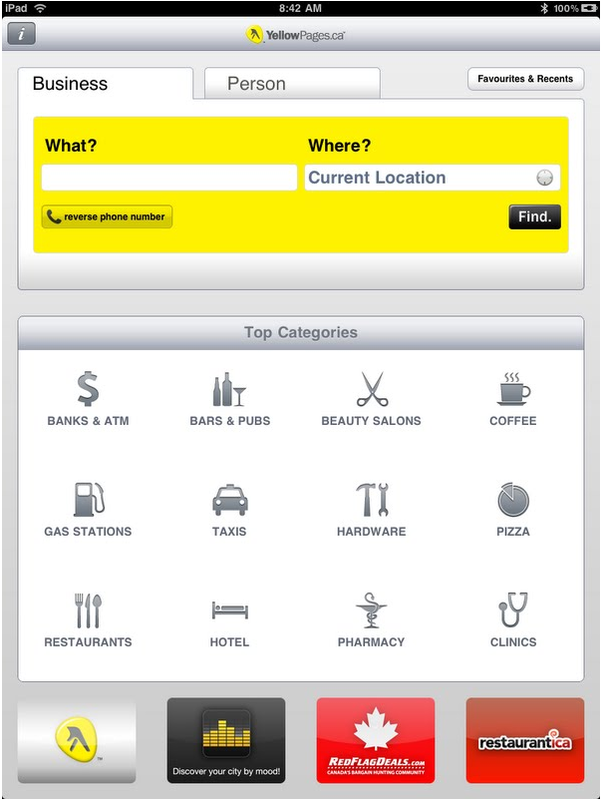 The Yellow Pages Group has ended automatic delivery of the residential phone directory in seven major cities. “An increasing number of Canadians, particularly in urban areas, use our online and mobile resources YellowPages.ca and Canada411.ca to find residential phone numbers,” Marc Tellier, president and CEO of YPG, said in a statement . . .
That move is expected to result in a reduction of more than five million copies – about 3,500 tonnes of paper – a year across Canada. In the affected markets – Montreal, Toronto, Vancouver, Calgary, Edmonton, the Ottawa-Gatineau area and Quebec City – delivery of the Yellow Pages directory will continue on an annual basis. 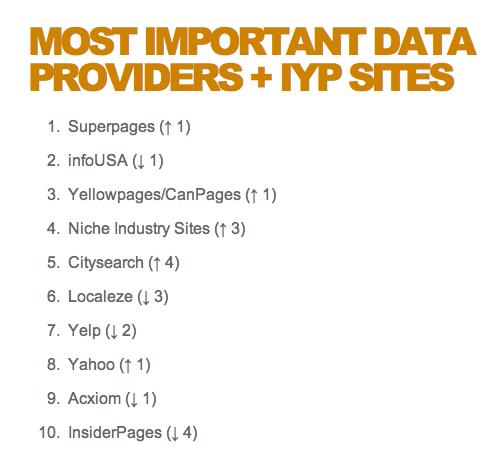 Right now most YP publishers offer an “opt-out” policy with print yellow pages. If users don’t want to receive them they can request cessation of print YP delivery. 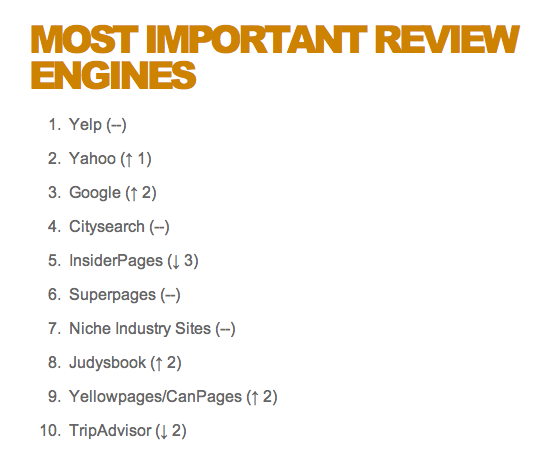 Yet the public doesn’t make the same distinctions between yellow and white pages that the industry does. White pages, for most publishers, are a “cost center” and deliver little or no advertising revenue. 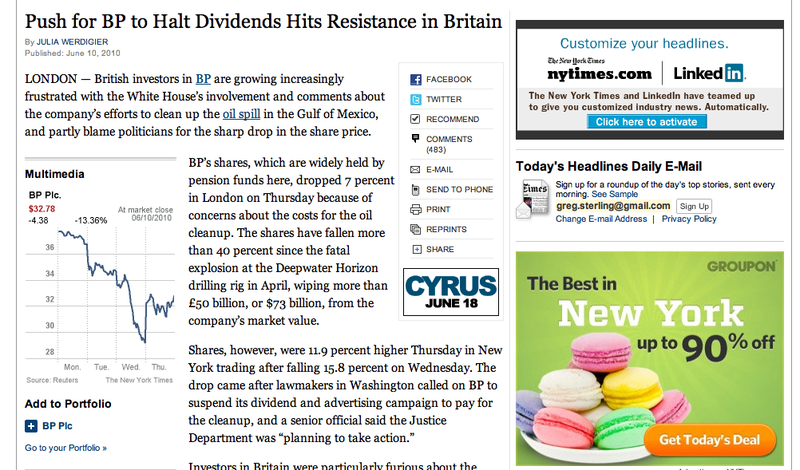 (There are some publishers in Europe for example that do make considerable ad revenue from print WP.) 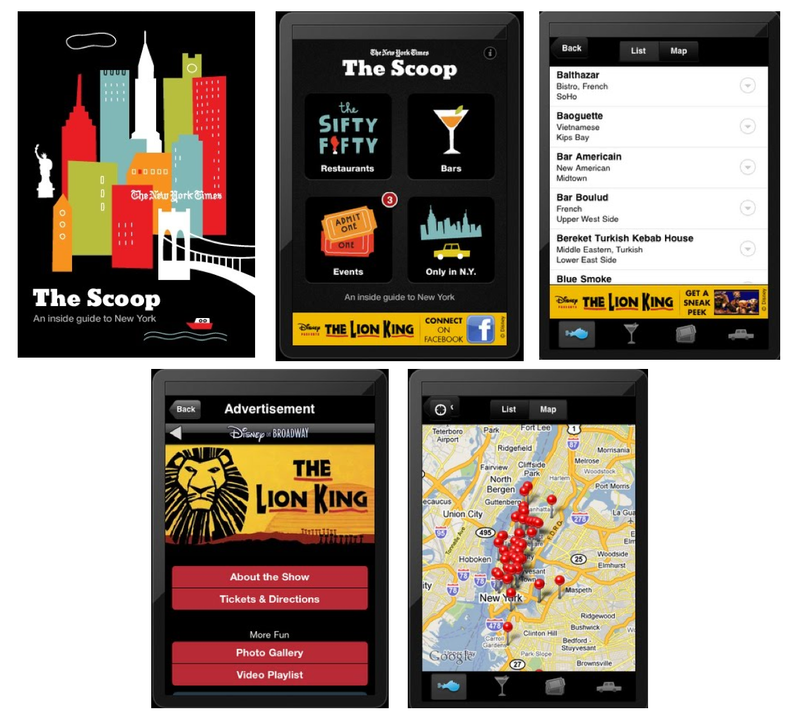 Print yellow pages generate the lion’s share of directory publisher revenue. 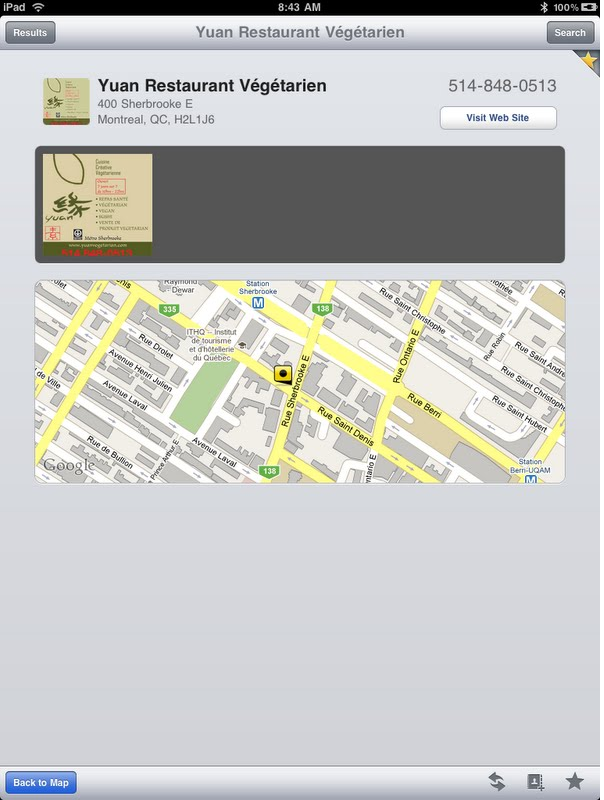 However consumers at large likely view white pages and yellow pages print directories in a very similar way. As I’ve argued in the past, pushing opt-in white pages means that relatively soon consumer, environmental groups and individuals will be calling for opt-in print YP (some already have). There’s a logic here that’s almost inevitable. Regarding the white pages initiative, publishers are seeking to be good “corporate citizens” even as they act in their own self interest to reduce costs. I’m not trying to say that they shouldn’t make WP opt-in. Yee, D-San Mateo, in February had trumpeted introduction of the bill, which would end home delivery of phone directories unless customers opt in to receive them. But when SB 920 came to a vote Thursday, eight senators decided not to weigh in — including the bill’s two co-authors and a few members who’d voted for the bill in committees. One of those earlier “aye” votes even turned to a no. Beginning tonight, logged in Yelp users will be able to easily make a reservation without having to leave the site or create an OpenTable account. Yelp users who already have an OpenTable account will automatically receive credit to their OpenTable account, for their reservation — no need to log into both sites. 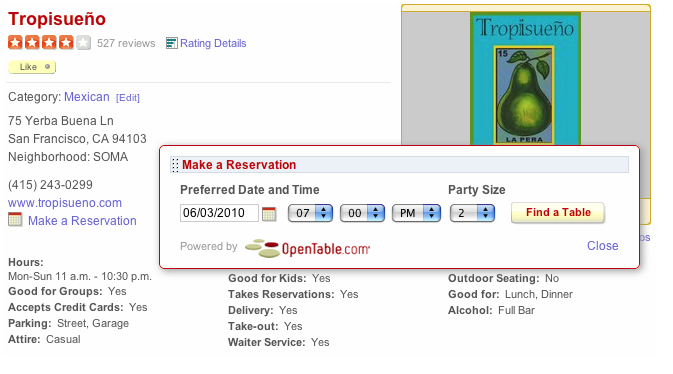 Yelp will presumably get an affiliate payment for every reservation it delivers.